Phnom Penh – WaterSHED Ventures, a Cambodia-based social business, has launched its Paradise Shelter in the rural market. The company specializes in innovative water, sanitation, and hygiene products for the aspirational BOP consumer. Its latest product – the first of its kind – is expected to significantly boost sanitation in rural communities. Cambodia has struggled to address the problem of widespread open defecation for decades. Years of NGO-led education campaigns and hundreds of millions of dollars in subsidies did little to curb the practice in rural areas. Sanitation coverage remained low: even by 2010 more than 75 percent of the rural population were still without access to a toilet. A lack of sanitation (i.e. defecating outside) is a serious global issue that puts families, and especially young children, at risk of diarrhea and other infectious diseases. According to the World Health Organization, diarrhea alone kills nearly 800,000 children every year, which is more than malaria, measles, and AIDS combined. But over the last six years, Cambodia has made tremendous progress. In 2015, Cambodia was ranked third among countries with the fastest decline in the rate of open defecation. Now more than half the rural population has access to a toilet and, last year alone, the government reported a near 10% increase in sanitation coverage. WaterSHED’s work began with efforts to deeply understand consumer motivations to install and use a toilet, as well as the barriers preventing them to do so. The NGO trained local construction businesses to manufacture and promote ready toilet kits that were both affordable and attractive to rural consumers. It introduced effective sales and marketing activities to stimulate consumer demand for toilets, and engaged local governments to continue supporting the burgeoning market to ensure it works sustainably. With a competitive prize from RELX (formerly Reed Elsevier) to explore alternative designs that reduce installation time and cost compared to a brick structure, WaterSHED engineered the Paradise Shelter. 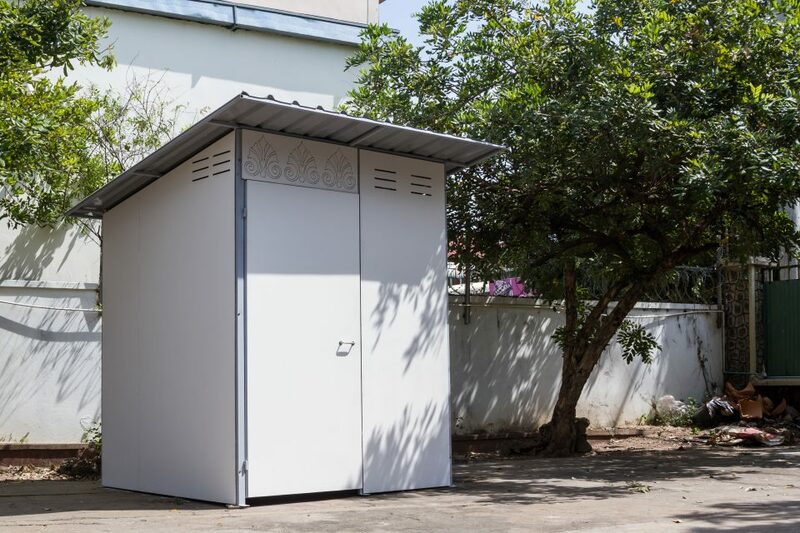 It’s the first mass-produced latrine shelter on the market in Cambodia, and consists of prefabricated modular panels that bolt together without the need for special tools. The structure is made from lightweight but durable materials and can be flat-packed for easy transport. Families can now install a toilet shelter with minimal labour and at a reduced cost. A press kit is available online with photos, logos, and additional information. For more information about WaterShed or WaterSHED Ventures, or for any press inquiries including booking interviews, please contact. WaterSHED Ventures is a water, sanitation, and hygiene (WASH) products company that offers modern choices for the aspirational BOP consumer. 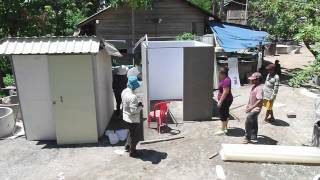 Based in Cambodia, the team has introduced Paradise Shelter – the world’s first flat-packed permanent latrine shelter for the rural consumer. It also distributes the award-winning LaBobo portable sink, designed to help mothers and children change handwashing habits, and has been featured in Al-Jazeera, Reuters, and Huffington Post. WaterSHED Ventures is supported with seed investment from WaterAid Cambodia, and incubated by WaterSHED NGO. For the latest news, follow WaterSHED Ventures on Facebook. By engaging key actors in the system, including small businesses, customers, and local government, WaterSHED facilitates the adoption of toilets, water filters, and handwashing stations – building a market that functions independent of traditional aid. To date, WaterSHED’s hands-off marketing approach has generated more than USD $8 million in revenue for rural businesses, and has helped accelerate sanitation coverage from a stagnant 25% to 56% in six years. WaterSHED is a twice winner of USAID’s Development Innovation Ventures competition, a winner of Canada Grand Challenges Stars in Global Public Health, and 1st prize winner of the Reed Elsevier Environmental Challenge. For the latest news, follow WaterSHED on Facebook and Twitter. WaterAid is an international organisation whose mission is to transform the lives of the poorest and most marginalised people by improving access to safe water, sanitation and hygiene (WASH). WaterAid was born from the water industry in the United Kingdom (UK) and has been operating for over 35 years, now working in 36 countries globally.